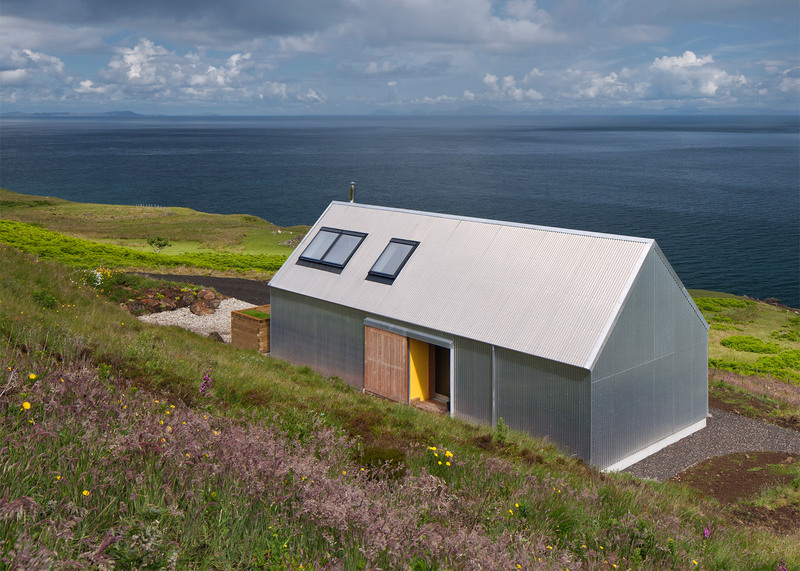 Scottish architecture studio Rural Design has completed a shed-like holiday home on Scotland's Isle of Skye, featuring corrugated aluminium walls that reference local agricultural buildings (+ slideshow). 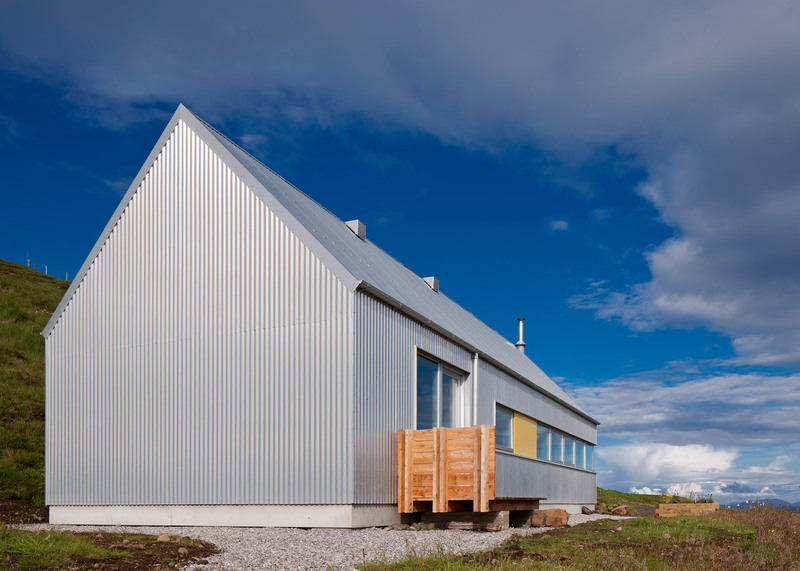 Rural Design founders Gill Smith and Alan Dickson designed and built The Tinhouse as a year-round rental home. 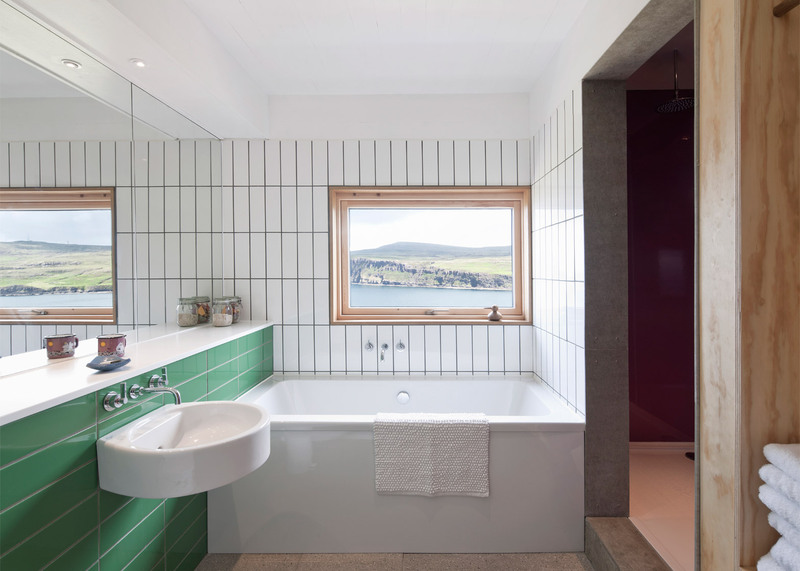 The husband-and-wife team let it the property while also operating their architecture practice in the town of Portree. The house is situated on a steep hillside site on the northwestern tip of the island, with views towards the Outer Hebridean islands. Its design is intended to embody the studio's simple and economical approach to its projects, which also include a small wooden house with a fully glazed facade framing views of its surroundings. The building was designed to evoke the form of the farmers' sheds dotted across the local landscape. Its aluminium cladding also references the robust, low-cost construction of these utilitarian structures. "The Tinhouse celebrates corrugated metal sheeting, commonly used on the agricultural buildings of the rural landscape," explained the architects. 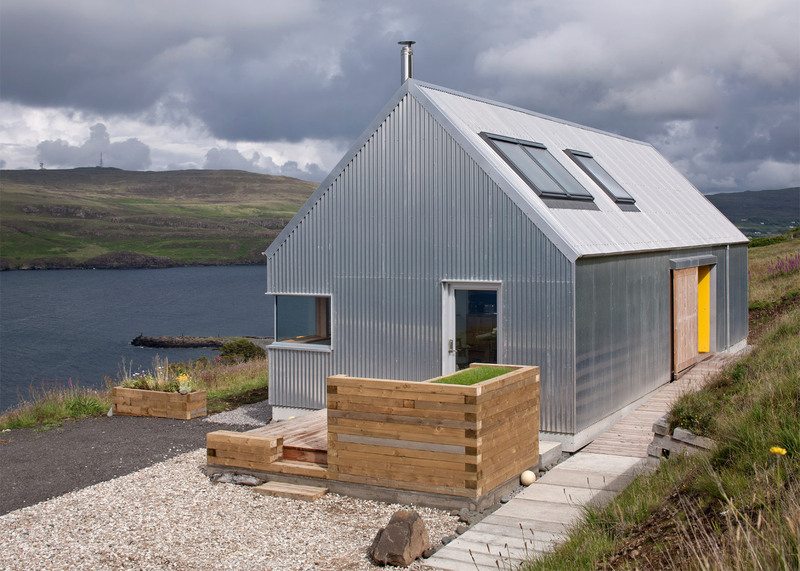 "It does so in a thoroughly contemporary way by using mill-finished corrugated aluminium as the external cladding for both roof and walls." The aluminium surfaces help to protect the building from the fierce storms that regularly batter the island, with minimal window openings. A narrow horizontal slot extends along one elevation to enable occupants to look out, as if from inside a hide, towards the best views of the landscape and seascape. The house was built for a budget of just £110,000, and employs materials and techniques chosen to make it straightforward for one person to perform the majority of the construction. 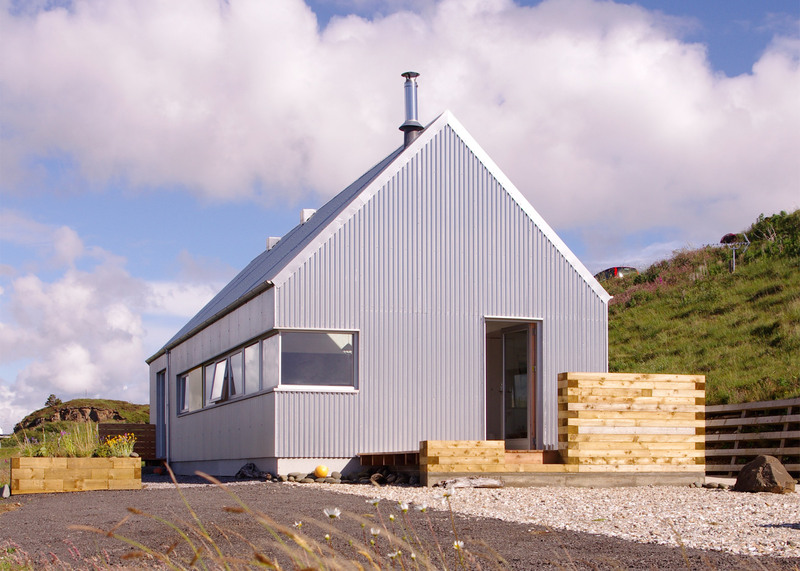 "In this way, the handmade Tinhouse celebrates the self-build tradition commonly found in a rural context," Smith and Dickson added. "Where greater numbers were required, for example to raise the gable wall panels or install the steel beams, this became a celebration and a social event." 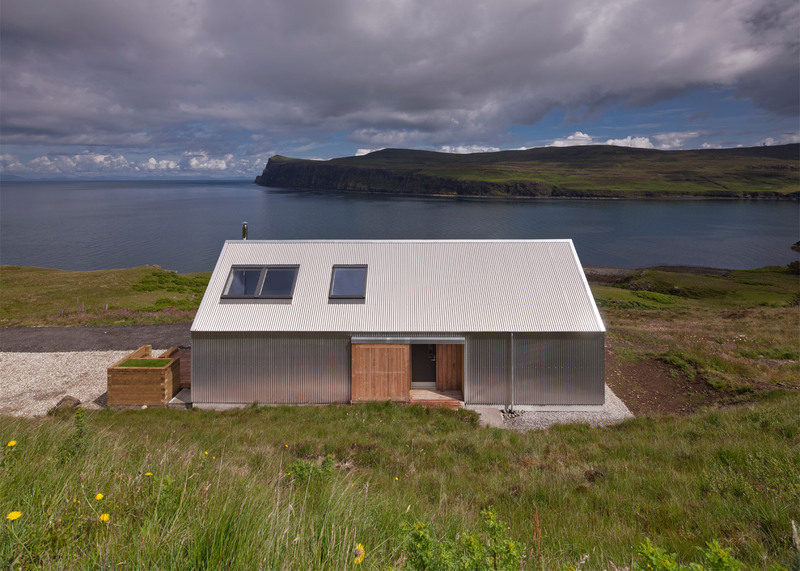 The building's compact dimensions reflect the scale of the small agricultural sheds found on the island, providing enough space for a double bedroom, a living area, kitchen and bathroom. Internally, the architects aimed to create "a character that is simultaneously modern and rustic", which was achieved by combining simple materials such as a concrete floor, plywood cabinetry and timber wall panelling. Recycled materials were employed wherever possible, including for the sliding pocket doors that can be used to close off the living space, bathroom and bedroom. These doors feature circular cut-outs instead of unnecessary handles. Beds and seats are built from unused structural timber, while the bedside tables are made from Douglas fir offcuts. Wooden dowels are used for door handles and coat pegs, and the shower is framed with leftover cement boards. Despite the narrow windows, the interior feels bright and spacious due to the high ceilings, skylights and predominantly white painted surfaces. Colourful touches integrated throughout the rooms recall hues found in the natural environment. In keeping with the simplicity of the building's material palette, the external landscaping utilises large sections of timber and hand-poured concrete to create pathways, sheltered areas, planters and a log store for the wood-burning stove.